More than 30,000 people live on Pohnpei, although nearly a fourth of these are immigrants from other nearby islands or foreigners (mostly U.S.) working on the island. English is almost universally understood, although Pohnpeian is more commonly used between native residents. The main town on the island is Kolonia, on the north side. The most prominent feature on Pohnpei is probably Sokehs Rock. This huge volcanic plug is only one-fourth as high as some of the interior mountains, but its position looming over Kolonia harbor makes it a dramatic sight. Although it looks forbidding, you can actually climb up the back side quite easily, and the view from the top is one of the best on the island! Pohnpei’s climate is tropical and humid. Kolonia town gets about 195 inches (4.95 m) of rain per year. Further inland, the SDA School where I lived receives closer to 300 in/yr, and rainfall in the interior is estimated at over 400 in/yr, making Pohnpei one of the wettest places on Earth! This isn’t as uncomfortable as it sounds. Clouds keep the temperature in the 80’s during the daytime, and there is usually a light breeze. Once you get used to it (it takes a while), it’s the perfect climate, just right, all the time. Typhoons rarely hit Pohnpei; more often they are spawned in Micronesia and sent on to Guam. Every several years or so on average, a mildly damaging tropical storm or depression will affect the island. This tropical climate keeps Pohnpei lush and green all the time. The heavy rainfall feeds a number of freshwater rivers and dozens of waterfalls, making the interior of Pohnpei one of the most beautiful places in the world. There are no dangerous snakes, animals, or insects, except for the centipede. Usually about six inches long, they can grow almost as large as one foot and carry a poisonous bite. Fortunately, they would rather live under rocks than in people’s houses. 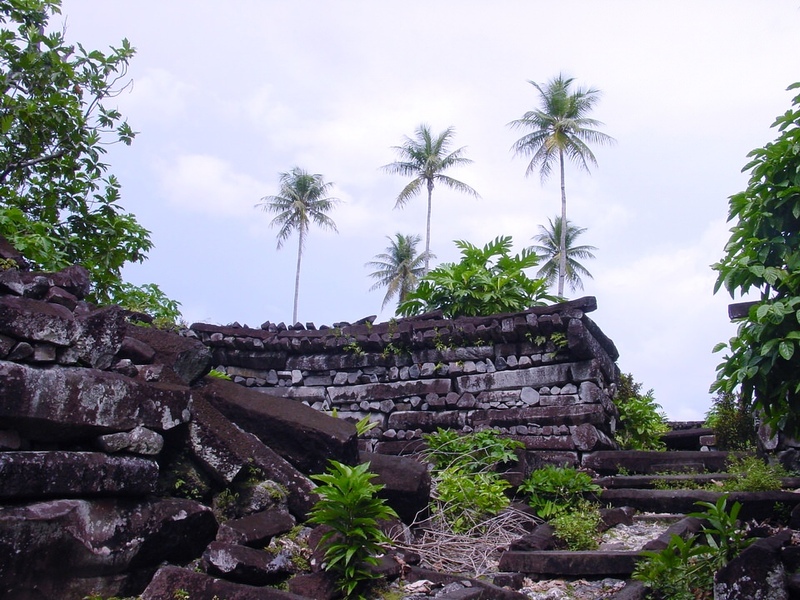 The haunting ruins of Nan Madol, the Machu Pichu of the Pacific, lie on the island of Pohnpei. Formerly known as Ponape (Pohn-ah-pay), this jungle-clad, reef-ringed island is in the Caroline group. Known for its high, green, volcanic cliffs and pepper plantations, Pohnpei lies about eight degrees North of the equator and is the capitol of the Federated States of Micronesia (FSM). A lost city made of stone “logs”, Nan Madol borders the reef protected jungle shore and is crisscrossed by a labyrinth of man-made, stone-walled canals. Abandoned hundreds of years ago, Nan Madol remains anÂ archaeological mystery. The reasons for its construction, how the multi-ton stone logs were transported or why it was abandoned are unknown. The major buildings are constructed of giant stone logs, 18 feet long and several feet in diameter. Stones are estimated to weigh up to two and a half tons. The logs are stacked like cordwood to form walls up to 40 feet high and 18 feet thick. The ruins can be visited by boat during normal tide ranges and by foot during low tides. The boat trip takes you through miles of dark mangrove tunnels. Finally, canal walls begin to appear before reaching the main structures that resemble the ceremonial squares constructed by the Mayans and Aztecs. The largest enclosure, approximately one acre in area even sports a central altar that smacks of the sacrificial platforms found in TenochtitlÃ¡n and Chichen ItzÃ¡. The U.S. Department of Interior designated the ruins as a National Historical Landmark in September, 1985,. Little known, the Nan Madol ruins on the Reef of Heaven consists of 92 man made islets that cover nearly 150 acres in shallow tidal waters. Radiocarbon dating shows Nan Madol was built beginning in the 13th Century AD. More recentÂ discoveries below the tidal level indicate occupation as early as 200 BC. The origin of the basalt building stones of Nan Madol is unknown. The hexagonal shape of the stones is natural and not man-made. The space between the stone structures is filled with coral rubble easily obtained nearby. Walls can reach a height of fifty feet. The ruins are administrated by the local chief (Nahnmwarki) but the government of the FSM and other universities are planning extensive excavations.